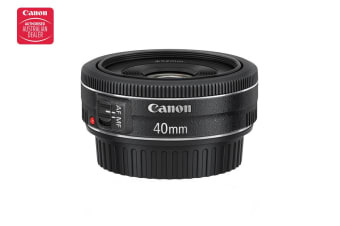 Lightweight and compact pancake lens. Your go to street photography lens. You’ll never be without your EOS thanks to the compact pancake EF 40mm f/2.8 STM lens. A perfect match to take better shots with your DSLR on the go. Explore shallow depth of field and use handheld shooting in low light without a flash with the maximum f/2.8 aperture. When you’re shooting movies or stills in live view mode, Movie Servo AF with STM uses stepping-motor technology to ensure smooth, quiet auto focus. Enjoy great DSLR image quality everywhere you go. Tackle everything from portraits to street photography and always with great image quality across the frame thanks to an aspherical lens design.